The West Michigan Sports Commission raised $6.8 million for Phase I of the Art Van Sports Complex, future home to a multi-field baseball/softball facility, without spending any tax dollars. When it comes to building a major sports complex, funding is always a challenge. The West Michigan Sports Commission managed to raise $6.8 million for Phase I of the Art Van Sports Complex, future home to a multi-field, championship-level, baseball-softball facility. The sports commission board’s goal was to build up infrastructure to heighten participation in amateur sports and bring in more sports tourism. The board decided to buy county-owned property and build from the ground up. With 79 acres available for fields and amenities, it fashioned a unique funding campaign to build its dream—without spending a single dollar out of any taxpayer’s pocket. “We started this process in a tough economic environment; the municipality just didn’t have the financial means to support this project,” said Mike Guswiler, president of West Michigan Sports Commission. To raise awareness about funding the complex, the sports commission board created the Everyone Wins Campaign, a multimedia campaign utilizing brochures, Powerpoint, in-person presentation packets and fact cards. The message proclaimed that everyone would win through the impact of economic tourism. Art Van Sports Complex goals are to attract youth amateur sports dollars; promote Michigan’s west coast as the ideal venue for youth and amateur sporting events; and overall enhance the region’s economy and quality of life. 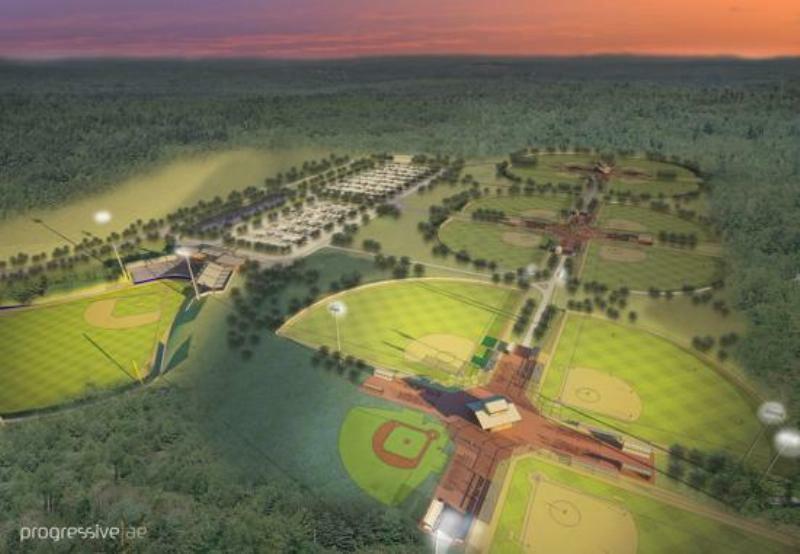 The complex is expected to attract baseball and softball tournaments from throughout the Midwest and generate an estimated total economic impact of more than $10 million for the West Michigan economy, including nearly $5 million in lodging revenue, in the first five years of Phase I operation. “A key part of the success of the campaign is attributed to West Michigan community leaders getting behind the project as honorary chairs to promote the cause and contacting major corporate and individual donors,” said Guswiler. Some of these community leaders were Richard DeVos, owner of the Orlando Magic NBA basketball team; Peter Secchia, former U.S. Ambassador to Italy and fund-raiser tycoon; Daniel DeVos, Amway cofounder and president and CEO of DP Fox Ventures, LLC; and Arend Lubbers, former president of Grand Valley State University. These community leaders, in collaboration with the board, asked corporate leaders to donate anywhere from $10,000 to $300,000. The fundraising effort received a major boost when Michigan-headquartered Art Van Furniture contributed a lead gift, securing naming rights of the complex and pushing the fundraising campaign total to $6.8 million, just $1 million shy of the Phase I fundraising goal. Other major corporate donors included the Meijer family, who started the chain of Meijer grocery stores in Grand Rapids; Steelcase office furniture, founded in Grand Rapids in 1912; and Wolverine Worldwide, a shoe manufacturer based in Rockford, Mich.
For smaller donations, there is an option to support the cause on the Everyone Wins Campaign website. The site says, “You can choose from several gift levels to honor a loved one, recognize a business or make a lasting gift to someone special.” Options for donors include a commemorative brick ($150), brass baseball ($250), brass softball ($500) or brass bat ($1,000). “We wanted to incorporate lower-level giving to offer a chance for all members of the community to give back,” Guswiler said. Grand Rapids ranks as the No. 13 city in the U.S. for generosity, or volunteerism and giving, according to a 2013 survey by NerdWallet. A public-private partnership (PPP) involves a contract between a public sector authority and a private party in which the private party provides a public service or project and assumes substantial financial, technical and operational risk in the project. This partnership benefits the Art Van Sports Complex because it is not subject to a city budget. A major problem for city-owned parks and fields is being subject to municipality budget cuts, possibly resulting in a lack of maintenance and amenities teams look for in sports tourism venues. “Parks and recreation are the first to get cut,” said Guswiler, declaring that the privately-owned complex will be able to provide what sports planners need. The Championship Field is a 385-foot, lit, fenced field with grass infields and a stationary mound. 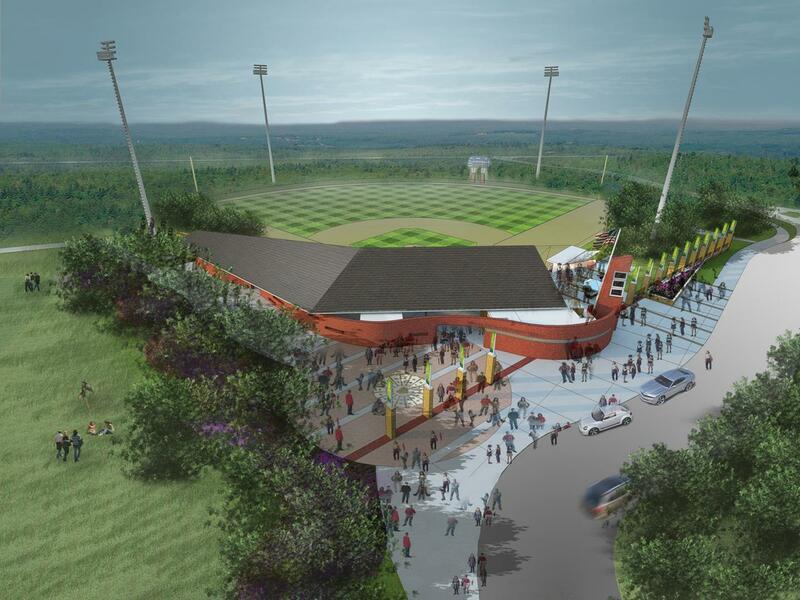 It will include a restroom and concession building, covered dugouts, a scoreboard, foul ball netting and covered grandstand that can seat 1,000. Quad A features two fenced fields with skinned infields (one 385 feet and one 350 feet), and one fenced field (385 feet) with a grass infield and stationary mound. Quad A also includes a Miracle Field, completed in fall 2013, which is a flat rubbery baseball diamond for disabled players who are a part of the Miracle League. Quad A will have a restroom and concession building, covered dugouts, scoreboards, foul ball netting and bleacher seating for 100 per side, per field. Quad B will include the same features as Quad A, but have four 300-foot fenced fields with skinned infields and portable mounds. The second and final phase does not have a set starting date, but plans include Quad C, which will be identical to Quad B, in addition to warm-up areas, boulevard landscaping, a play structure, picnic shelters and parking for over 800 cars (initial phase accommodates about 400 cars). With a new facility and hosting the 2016 NASC, Mike Guswiler and the West Michigan Sports Commission are creating a major economic impact for the region.